Having been involved in University of Nebraska sports broadcasts since 1974, Mike Elliott has seen the ongoing growth of technology firsthand. As Director of Broadcast Operations for the Husker IMG Sports Network in Lincoln, Elliott oversees a radio team dedicated to bringing Nebraska sports action – especially football games – to fans throughout the region and around the world. Another PSM 900 feature that Elliott finds useful is MixMode®, which lets the user blend two independent signals as desired, using the pan pot on the P9R bodypack receiver. “Basically, it lets you treat your stereo signal as two separate mono channels,” he says. “We use it for the parabolic field mic operator on the sideline. He needs to hear what he’s picking up, so he gets that signal soloed along with the crew chatter, then uses MixMode to blend them as needed.” Using MixMode, announcers can adjust the headphone balance between their own voice and other production elements. Being so reliant on wireless, a big part of Elliott’s responsibilities revolve around frequency coordination. “Between the TV broadcaster, opponents radio broadcasts, referee mics, plus 80 channels for the coaches’ headset systems, there’s typically well over 100 active channels at a game. At the Rose Bowl, the total was about 250,” he notes. “With our Shure systems, we’ve never had a problem finding enough clear channels for our needs.” To manage that, the university has its own frequency coordinator, who works closely with us and everyone else involved ensuring that they have the clear frequencies they need on game day. 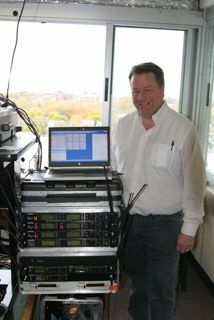 When on the road with no local frequency coordinator, Elliott works with coaches' headset crews and the national TV broadcast RF techs to fully coordinate RF at the game site. In addition to its flagship coverage of University of Nebraska football, the Husker IMG Sports Network relies on Shure wireless for its broadcasts of men’s and women’s basketball, volleyball, baseball, and softball, all while producing a three-hour sports talk show that airs five nights a week year-round. To handle the inevitable conflicts when various events overlap, the network operates its own uplink, with three satellite channels to handle distribution. Live Internet streaming provides even more global reach in real time.